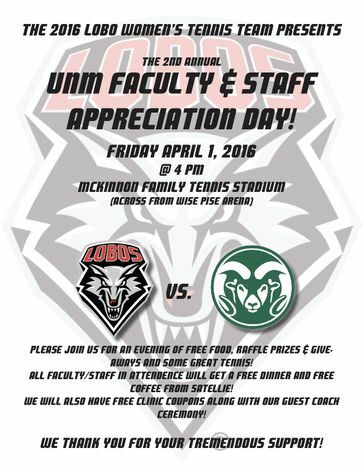 The 2016 Lobo Women's Tennis Team hosts its 2nd Annual UNM Faculty & Staff Appreciation Day Friday, April 1 as they take on Colorado State at 4 p.m. at the McKinnon Family Tennis Stadium. All faculty and staff members are invited to enjoy some great tennis and will recieve a free dinner and coffee. There will also be raffle prizes and give-aways along with free clinic coupons.